For Pretty Pink Posh Blog Hop please click Here. Welcome back to Wplus9 Day 4 June 2015 Previews! Today I am showcasing Greetings & Salutations stamp sets and dies. To begin my first project I white heat embossed the kraft panel first and cut it smaller than an A2 card. Next I stamped the square lined image from Greetings & Salutations masking half on the die-cut piece and stamped the image and do the same on the other half to achieve the two tone look. For my second project I die-cut the rectangle die using the Coordinating dies from Greetings and Salutations to create a random windows on the card. Next I stamped the matching image and adhered with foam tape for dimension. For the sentiment "bonjour" I stamped it with the new crisp PURE COLOR Black dye ink which I love! I also added the bunnies (fussy cut) from the new Happy Mail stamp set to make them hold the sentiment, then added some enamel dots to finish off the card. What super CUTE cards, Joni! Those are awesome stamps! I like the first card with all the colors, kraft paper, and the white ink. I am not always sure what to do with a more graphic stamp and that was a neat card. Love how you used the scribble square with two colors! 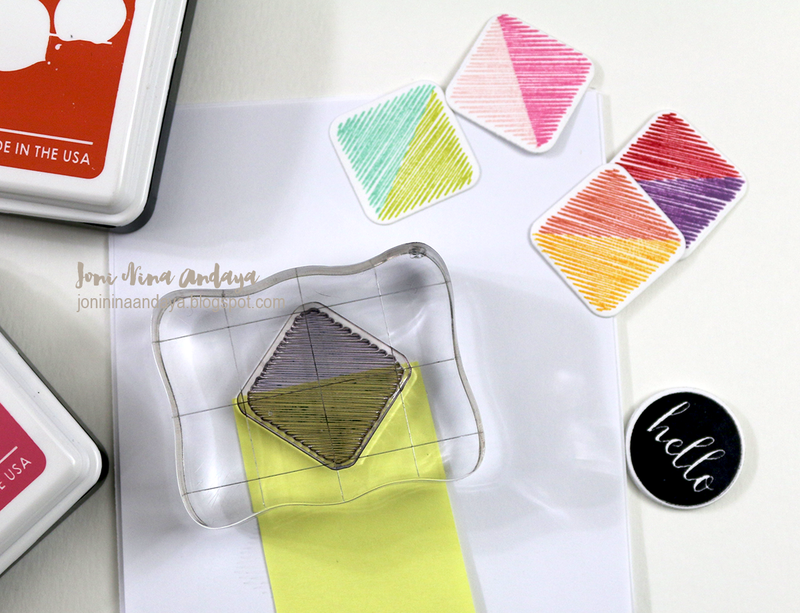 What an adorable idea for shape dies! So gorgeous! LOVING the colors!!!!!!!! Fabulous cards Joni!! I love those cute little bunnies! Oh, I love your card with the bunnies!! Oh.my.gosh!!! These are SO fun! Wow! I love these pretty window panel cards! Very unique!